Under crowdfunding regulations Tagcash can help raise up to 10m Pesos (approx $200,000), by selling a percentage of a company to the public via the Tagcash crowdfunding portal. Existing or newly formed companies can create a request to raise funding, adding a 2 to 5 minute video elevator pitch, a business plan in text or PDF format, and major team members, along with the amount you wish to raise and the percentage of the company you want to sell. Once approved, the campaign to raise funds is viewable for 30 days, after which the campaign is open for a further 60 days for the general public to buy shares. Once the target has been met, the campaign is closed and the funders receive their money. If the campaign target is not met after 60 days, all pledged funds are immediately returned. Investors also have up to 48 hours before the campaign end date to cancel their pledges. As an investor, the advantage of investing funds this way, is liquidity. Shares can easily be sold or traded at any time. For companies raising funds their investors may include their own customers who have a vested interest in seeing their investment grow. For amounts above $200,000, Tagcash can help raise funds from investors in 2 ways. The first method can be done with a limit of 19 investors, with the shares issued and locked for one year, and thereafter freely traded. The second method would be done under Philippines Initial Token Offering (ITO) regulations, with any number of investors, and would be freely tradeable at the successful conclusion of any campaign. Funding can represent sale of company shares, commodities futures, interest or dividend bearing assets, property investments and more. Pledging and purchasing of shares can be done by Cash, Bitcoin or Ethereum, from within the Tagcash Wallet. 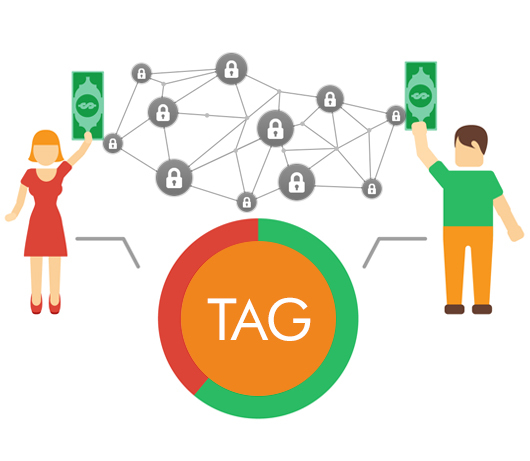 Tagcash only charges on successful campaign targets being met and accepted, with a fee of 5% of the total amount raised. Secondary trading incurs a fee of 5% paid by the seller of shares. Which jurisdiction is Tagcash equity crowdfunding governed by? This service is regulated by the SEC in the Philippines, where the securities issued are exempted for 10m PHP raised (approximately USD 200,000), per company, per year. If you are based outside of Philippines, you will need to create a Philippines SEC company after successful completion of any crowdfunding campaign, before any money can be made available. Tagcash can help in creation of an SEC registered entity. I am an investor - How do I buy shares? Once a campaign is made active, investors deposit money into Tagcash and pledge to buy shares in companies, but can cancel their pledge anytime untill 48 hours before the end of the campaign. Once the campaign ends and has successfuly met the target, investors are issued share tokens that are issued to a Tagcash wallet and can be transferred to others, or traded on the Tagcash secondary exchange. back. Tagcash also offers high net worth individuals a chance to invest within the first 30 days of a campaign, where it is not open to the general public to buy. If the sucessfully raised target amount is larger than USD 200k and/or there are less than 17 investors, then the campaign would not continue to be offered to the general public. The shares issued are locked for one year before being tradeable. Investors can invest up to 50,000 pesos per year in multiple campaigns, but if investing more, will be asked to agree to a waiver, confirming that they know what they are doing, and that they may risk losing their investment. As an investor you should be aware that many of these companies are new, and you are at risk of losing your entire investment. However, should a company fail during the first 12 months after funding, investors may recoup some of their investment. I would like to raise funding for my company - What should I do? Once you have been aproved, you would upload a 2 to 5 minute video pitch and a business plan in PDF format, and add your team member bios and pictures. The campaign would be made public for 30 days, during which private investors would be able to pledge to buy shares. This may complete the fund raising, but if not, the campaign would be made public for a further 60 days to anyone who would like to invest. Once a campaign is successful, it is closed and you receive the money in 4 quarterly payments. The first payment starts when you transfer shares in your company to Tagcash to hold as nominee shareholder. Tagcash can help create the SEC registered company if it has not already been done. Should you wish to cancel a campaign at any time during the 60 days, all money would then be returned to the investors wallets, with no fees incurred by either investors or fundraiser. When creating your business plan, you must include the following - the busines plan can then be given out to anyone as a prospectus to raise money. What types of shares are offered? Tokenized shares that are offered would represent normal voting rights shares, although the actual shares would be held by Tagcash as nominee shareholders. Investors should be aware that these shares and voting power may be diluted if the company raises funds elsewhere. How do I sell or transfer my shares to others? Shareholders can transfer shares to any other users within the Tagcash platform or to anyone with a Stellar based wallet. However, all users must KYC Level 3 verified with Tagcash before they can receive share tokens. Shares can also be traded on the Tagcash Secondary exchange - there is an associated fee of 5% charged to the seller of the tokens. 2014-2019 © Tagcash Ltd. All Rights Reserved. The process for the offer, purchase and issuance of securities through the intermediary and the risks associated with purchasing securities offered and sold in reliance to these Rules; ii. The types of securities offered and sold in reliance on these Rules available for purchase on the intermediary’s platform and the risks associated with each type of security, including the risk of having limited voting power as a result of dilution; iii. Any restriction on the resale of a security offered and sold in reliance on these Rules; iv. The types of information that an issuer is required to provide under Section 4 – Disclosure Requirements, the period and frequency of the delivery of that information; v. The limitations on the amounts an investor may invest pursuant to Section 3 – Eligibility for Exemption from Registration; vi. The limitations on an investor’s right to cancel an investment commitment and the circumstances in which an investment may be cancelled by the issuer; vii. The need for the investor to consider whether investing in a security offered and sold in reliance to these Rules is appropriate for that investor; viii. That following completion of an offering conducted through the intermediary, there may or may not be any ongoing relationship between the issuer and intermediary; and ix. That under Section 46 – End of Compliance, an issuer shall cease to publish annual reports. Section 4 - Disclosure (a) Chosen intermediary via SEC list of registered CF Intermediary (b) Nature of its business, financial condition, historical reports of operation, (c) Business plan with respect to CF offering; d) Risk factors of investing in its project (e) Procedure on how to return funds if target offering is not met (f) Procedure to complete or cancel investment commitment Section 14. Promoters - In connection with establishing an account for an investor, an intermediary must inform the investor that any person who promotes an issuer’s offering for compensation, whether past or prospective, or who is a founder or an employee of an issuer that engages in promotional activities on behalf of the issuer on the intermediary’s platform, must clearly disclose in all communications on the intermediary’s platform, respectively, the receipt of the compensation and that he or she is engaging in promotional activities on behalf of the issuer. Section 15. Compensation Disclosure– When establishing an account for an investor, an intermediary must clearly disclose the manner in which the intermediary is compensated in connection with offerings and sales of securities in reliance on these Rules. Obtain from the investor the following: a. A representation that the investor has reviewed the intermediary’s educational materials delivered pursuant to Section 13 – Educational Materials, understands that the entire amount of his or her investment may be lost, and is in a financial condition to bear the loss of the investment; and b. A questionnaire completed by the investor demonstrating the investor’s understanding that: A. There are restrictions on the investor’s ability to cancel an investment commitment and obtain a return of his or her investment; B. It may be difficult for the investor to resell securities acquired in reliance on these Rules; and C. Investing in securities offered and sold in reliance on these Rules involves risk, and the investor should not invest any funds in an offering made in reliance on these Rules unless he or she can afford to lose the entire amount of his or her investment. c. A waiver to the investment limit requirement from an ordinary investor if the ordinary investor intends to exceed the Php50,000 investment limit requirement. Section 19. Resale of Securities – An intermediary intending to provide a secondary market for the offer and sale of securities in reliance to these Rules, must include in its operational framework the rules and procedures by which the resale of securities in reliance to these Rules will be conducted, and provide in its platform the necessary arrangements in conducting the resale of such securities. Send email on pledging - Notice of Investment Commitment i. The peso amount of the investment commitment; ii. The price of the securities; iii. The name of the issuer; and iv. The date and time by which the investor may cancel the investment commitment. Send email on purchase of equity - Confirmation of Transaction i. The date of the transaction; ii. The type of security that the investor is purchasing; iii. The identity, price, and number of securities purchased by the investor, as well as the number of securities sold by the issuer in the transaction and the price(s) at which the securities were sold; iv. If a debt security, the interest rate and the yield to maturity calculated from the price paid and the maturity date; vi. The source, form and amount of any remuneration received or to be received by the intermediary from persons other than the issuer.